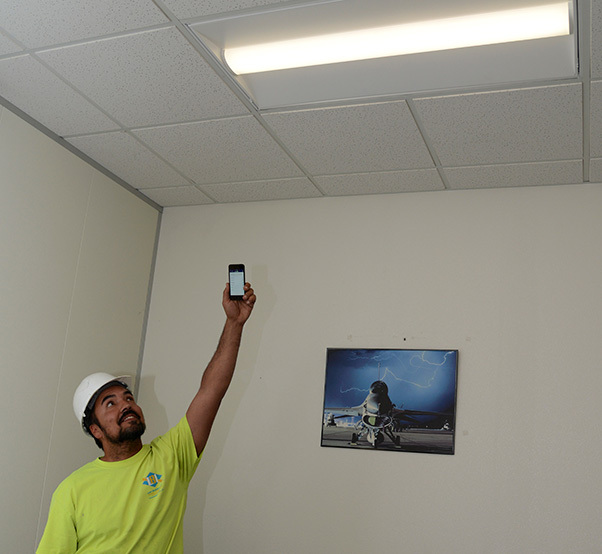 Luis Sandoval, Lead Builders electrical foreman, demonstrates how to adjust a new light fixture with a downloadable app for a smart device. The 412th Civil Engineer Group is overseeing a large lighting upgrade across Edwards AFB that will bring better working conditions and savings to the base. 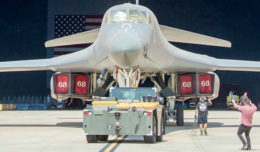 The 412th Civil Engineering Group at Edwards Air Force Base, Calif., is in phase two of a base-wide, major lighting upgrade, which replaces inefficient fluorescent lighting with new LED lighting complete with motion sensors and programmable controls. Each phase will take about a year to complete. “In California the average home uses 6,684 kilowatts and we saved 2,310,108 kilowatt hours, which is equivalent to powering 345 California homes,” said John Shartzer, 412th CEG Energy and Utilities engineering technician. New LED lights are brighter and work more efficiently than what workers are accustomed to. 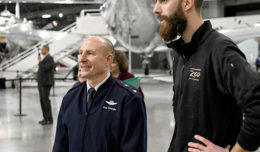 Previously, lighting in some hangers was so inefficient that maintenance workers would need to bring in light stands to see what they were doing, according to Shartzer. Lighting was not only replaced, but additional fixtures were also added to base aircraft hangers. The new light fixtures’ motion sensors allow for only essential lights to be on when needed. Once a worker leaves a lighted area with the sensors, a timer times out and the lights are turned off, saving a lot of energy, Shartzer said. Phase one cost $3.9 million with upgrades made to eight buildings consisting of hangers and administration offices. Lighting fixtures were replaced, and in some offices, retrofit kits were used to improve lighting. The new LED lights can be controlled by an app downloaded to smartphones or tablets to regulate the brightness of the lights and control when lights turn on and off. Lighting can be customized for each office. Shartzer said the cost savings for phase one is $927,000 annually. Cost savings is not just in the energy savings, but also in maintenance and demand charges. The lighting is made by a Southern California company who offers a 10-year warranty on all their products covering the lights if they break and if there is degradation. “If I go in and take a light level reading today and its 100, and come back in 10 years and its 95, they will replace the light and pay for labor to have it reinstalled,” said Shartzer. The second phase of the project began April 16. Eight more buildings are being upgraded. Light fixtures in the Exchange and food court will be replaced as well. In the third phase, 46 buildings will be upgraded throughout Edwards AFB making it the largest lighting effort. The additional annual savings for phase three will be $923,000 and it will save 4.6 million kilowatt hours. “Our projects are geared to improve working conditions and save money not only on the base but for the taxpayer. That is important for our office to do and we are not done,” Shartzer said.